It is hard to believe it is now 14 years since we got the pilot, Flight Sergeant Lex Cameron "Lew" Dwyer to Kununurra to open the 'Wirraway-Challenge' Display on March 20th 2005. His friend and co-pilot, Flight Sergeant, Warwick Carmody, joined us by phone from hospital that day in 2005. Warwick Carmody provided us some great photographs and information and after WWII he would become the Town Clerk of Bunbury. A story of survival and rescue of two RAAF pilots by Aboriginal stockmen from Carlton Hill station - When war came to the Kimberley (this was just a month after Darwin was first attacked). Part 5 of 8 - Wirraway A20-62 Forced-Landing (The Main Story) - 29 min. This year of 2018 marks the centenary of the end of World War I and these exhibitions were initially researched and devised locally then with thanks to further research by the Royal WA Historical Society, the panels then professionally designed with great collaboration between each Society and staff of the WA Museum and Museums & Galleries Australia WA, along with a museum quality showcases for the Kununurra and Wyndham Museums. 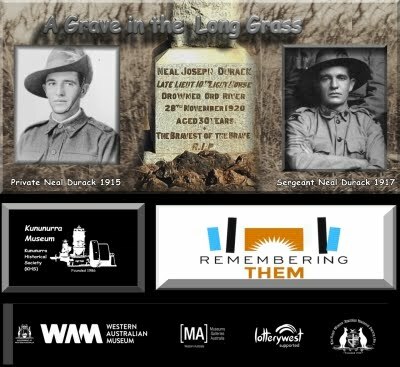 The Remembering Them project that has been in progress since 2014 (to 2018) to commemorate the 1914-1918 WWI centenary) has been generously funded by Lottery West and the WA Government. Thanks to the Army Museum (Fremantle) WA for temporary display objects of the 10th Light Horse (for Kununurra Museum), as well as the WA State Records Office for images of the 'cancelled public plans' and the State Library of Western Australia who supplied photographs (& plans) for use on the history exhibition panels. 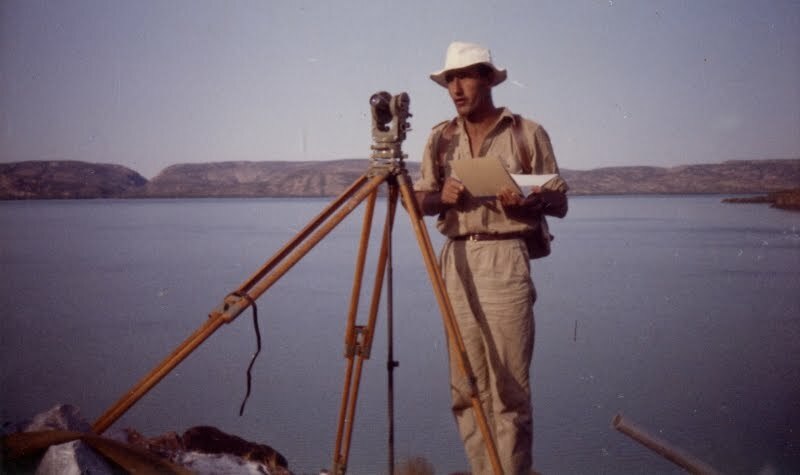 A great new collection of 193 photographs have been derived from the album made by Henry Hall, who was in charge of Operation Ord Noah during the 1971-72 wet season, which saw Lake Argyle fill for the first time. Henry was part of the wildlife group Western Australian Wildlife Association (WAWA so when you see WAWA on boats in this collection that is nothing to do with the Water Corporation's former title post PWD, Water Authority of Western Australia - WAWA). Clicking album page below will take you to the Album collection, once there click on an image then scroll down for further information or view ALL as a slideshow (only available from main album page - near top right of page). This adds to our collections online, with more than 2,400 photographs available in our collections on Flickr, which now, have had over 2,100,000 views (since 2011), so what otherwise would have been seen by nobody, languishing in the archive, have been made "ACCESSIBLE to ALL!" and are being made more and more "DISCOVERABLE" through social media avenues. On behalf of the Kununurra Historical Society, we hope you enjoy. In June 2017 we have 125 members, most being spread around Australia with about 20 local members, of whom around 10 members regularly attend our monthly meetings, with only one member actively carrying out all work on the archive and opening the Kununurra Museum. We are in need of new members and as Kununurra has had many more than this live here over the fifty-five+ years of the town, who would be interested in this history, so the potential for new members is high. Government funding for heritage generally has been slashed, and in spite of our isolation, we must crowd-source our own funding and the aim is for KHS to have 1000 members, hoping that past and present residents of Kununurra can see the great value in preserving a local research collection and all associated with that by supporting us and joining KHS as Life Members (10 x annual membership). To all past and present residents, we NEED your Support! 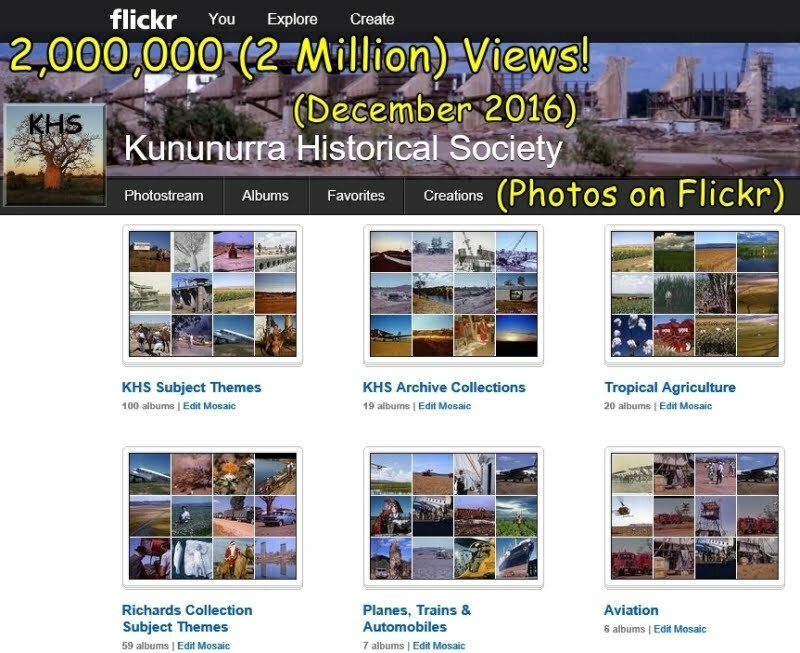 If you like what you see as you view the online content we are making accessible to all, over 2,500 photographs online and digital video on the Kununurra Museum YouTube Channel, please Join KHS! 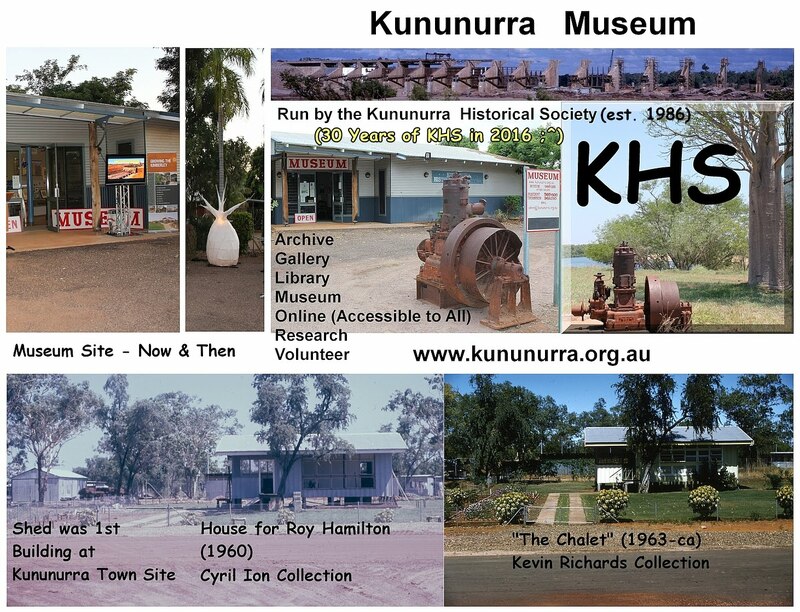 Support the Kununurra Museum, you can support this work to continue - Please Join KHS Now! We hope from what you have seen of KHS online presence to date, that the work being done at KHS is a worthy cause and you would be assisting for this great work to continue and increase. Are you one of those who loves the history presented here - Please donate! You would be assisting the important work of actively collecting and preserving our history, of local, State and National significance. If you can afford to, your donation would be greatly appreciated and help to preserve this local history research repository. You can go to our Join KHS now page to get KHS BSB & A/C details to donate directly or you can keep track of all of your donations at the KHS GiveNow page from >> https://www.givenow.com.au/khs! 1963 Royal Tour - Royal LIKE! Our friends at the Northern Territory Police Museum & Historical Society (NTPMHS), who first suggested using Google Sites, the base from which I have tweaked and hacked more functionality out of, for this Google Hosted (Apps for non-profits) kununurra.org.au website, ever since we started in late 2010. Thanks John! - I found on the NTPMHS cool YouTube Channel, that they had footage of the Royal Yacht Brittania arriving in Port Darwin in March 1963 as well as the Royal Party arriving at the RAAF 'drome Darwin. An 8mm home film from the NTPMHS Mannion Collection. Striving to Make #KimberleyHistory Collections More Discoverable for All! 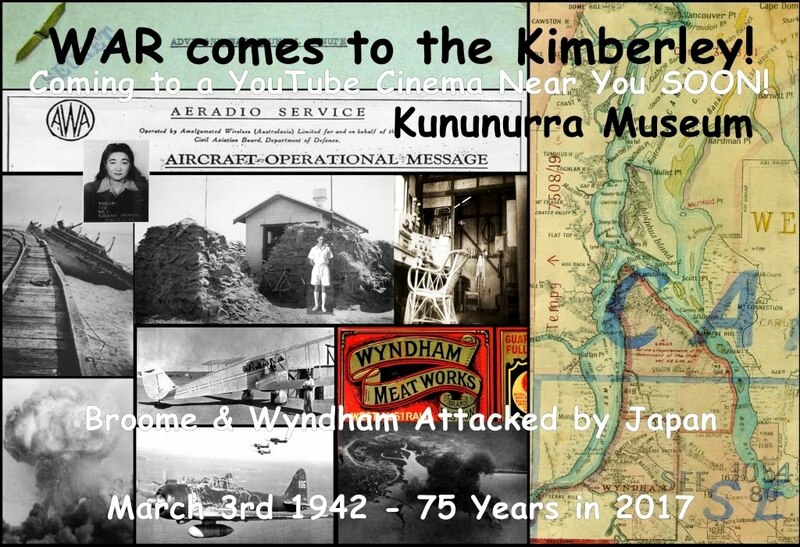 Activity on Social Media to promote these commemorations has resulted in posts to the Kununurra Museum Facebook Page https://www.facebook.com/Kununurra.Museum/ to promote the 8 x Parts of the Wirraway-Challenge digital video (DV) on the 'Kununurra Museum YouTube Channel' from http://www.youtube.com/user/KununurraMuseum. Since February 2017, the Kununurra Museum now has a 'Twitter Account' - If you don't know what Twitter is all about (as I did not until signing up and using :^), basically you have exactly 140 characters (that is letters not words) to get your point across and squeeze in a URL if you shorten it (I guess some leaders, that's about as far ahead as they can think - 140 characters ;^) At any rate I soon figured things out and realised these weird Nation leaders we seem to be having are not worth following, so started following Galleries, Libraries, Archives & Museums (the "GLAM" sector) from all over the World and it has opened up a new world of live twitter feeds from these organisations, announcing new collections digitised and many other interesting articles and DVs, which I have been sharing. See http://twitter.com/KununurraMuseum - Already amazing collections relevant to Kimberley History have emerged, for example did you know that you can download the entire 7 Volumes [or 8 ?] of John Gould's 'Birds of Australia' published in 1844 as PDFs or eBooks or JPG images from the incredible Biodiversity Heritage Library - Will place a link to some resources there on the KHS Researchers Page. In December we had our 2nd Millionth view of our archival photographic collections on Flickr! KHS has over 2,000 images online which can be viewed in various ways. Our first Million came in August 2014 which took 3 years and six months from when we started on Flickr in 2011. Our 2nd million views took 2 years and four months from August 2014 (1st Million). If we had not digitised and put these online, they would have still been in the archive and virtually nobody would have seen them. KHS - Making archives accessible to all - from anywhere in the world! The Kununurra Historical Society (KHS) - Wyndham Historical Society (WHS) Christmas get-together will take place this year at the Kununurra Museum. Last year's at the Wyndham Museum was well attended and enjoyed by all. This year we are meeting at the Kununurra Museum on Saturday, December 17th, starting at 11 am. All KHS & WHS Members are invited to attend and are asked to bring along a plate of food to share. To All KHS Members & Supporters - Have a Merry Christmas in 2016 and a Happy and Prosperous New Year in 2017! From the Kununurra Historical Society. Congratulations to Kununurra Historical Society! Kununurra is a remote and isolated location but this does not deter the Society. Despite, or as a result of this remoteness, the Society has made a push to develop its digital resources which have been uploaded onto a very informative website. The website includes a wealth of information about Kununurra, including photographs, local events and news. This year three volunteers recorded 3,330 hours on a variety of tasks, including digitisation of the collection, transcription activities and working on the archives. In dollar terms this work is worth some $116,550. The Museum, which in 2015 was open five days a week, increasing to seven days a week in 2016, attracts a large number of visitors. Over the past year 2,009 people have visited. This year Kununurra celebrates its 30th year in operation. Well done! The engaging three day Museums Australia WA (MAWA) conference - Engaging Communities - New Times, New Strategies, 12-14 October 2016 was also attended by the KHS President, with a full three day program of tours and interesting speakers, we were kept up to speed on what's happening at the cutting edge of other collecting institutions and museums in WA, as well as in the UK and the USA - from where we learned about "Museum Hack" tours at "the Met' " museum in New York. The conference had much of interest on offer and was very useful for networking with other attendees, well worth attending. Being as remote as we are (>3000 km from Perth by road) it would have been unlikely we could have attended without these bursaries, which are greatly appreciated by KHS and we thank all involved from both organisations (RWAHS & MAWA) who assisted in organising these travel bursaries and for the funding from LotteryWest to attend both the RWAHS and MAWA conferences. On Tuesday, June 14th 2016 at 7pm at the Museum - A Great Talk! An Ord-Victoria Rivers Region stockman who was at Wave Hill and other NT & Kimberley stations back in the 1940s, Donald Howard, visited Kununurra in June gave a great talk during the presentation event at the Kununurra Museum. Donald has presented his genuine hand-made, and much revered in Ord-Victoria Station history, 'Fred Gutte spurs' or 'Wave Hill spurs' that he has donated to the Kununurra Historical Society collections. The spur collections have been popular displays and have already (19 VIII 2016) been seen by the many dry season visitors to the Kununurra Museum since Donald's talk and presentation. Fred Gutte was a highly skilled blacksmith at Wave Hill station in the 1940’s and Donald has personal reminiscences in his memoirs describing some days working with him in the blacksmith's shop at Wave Hill, which are a priceless record. Photograph to right shows Donald Howard holding his Wave Hill spurs. Gutte made the spurs to his own design and sold them to stockmen and drovers on their personal order. The spurs became famous on every stock route and station throughout northern Australia. Donald said he had paid Mr. Gutte several old-style round tins of Log Cabin for the job. "A few months ago I presented the museum with 'The 1886 Rosewood Penny' which I found on Rosewood Station near the NT-WA border,” Donald said, going on to explain that they were droving cattle from Wave Hill station to the Wyndham Meatworks. "While watching cattle graze during ‘dinner camp,' I was scratching some small squares of dried mud left in a creek bed after the Wet, when one square failed to break up. 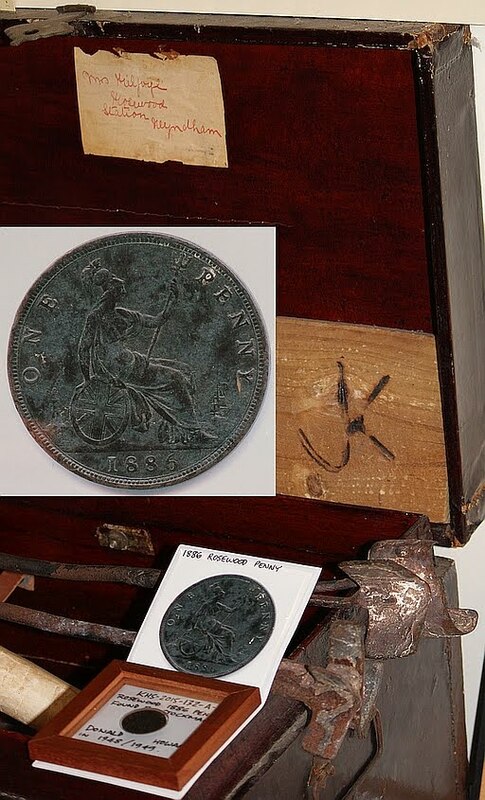 I gave it an extra poke then picked it up and found an 1886 English penny which is now on display at the Kununurra Museum." The 1886 penny is now 130 years old, that being the same year that we are commemorating this year, when Wyndham was proclaimed a town at Cambridge Gulf, the northern hub to the Halls Creek gold-rush that set in that same year. The 1886 penny is now on display with Mrs Tom Kilfoyle's 1890's travel trunk, and some 'well used' (a 'TK' & 'JK') Rosewood Station branding irons at the Kununurra Museum. Donald said he hoped his donations would not only be a welcome addition to the museum’s collections but would 'spur on' others to give items of significance to this growing regional collection. Response was good to a plea for an old pair of RM Williams Cuban Heel Stockman's boots that were no longer in use, as the fitting item to display the Wave Hill spurs on, and we now have 2 x pairs. This was fortunate as Ian Petherick donated spurs owned by his late father Hugh Petherick (VRD - Legune - East Kimberley) said to have been acquired by Hugh from Lake Nash station NT, close to the Queensland border in the 1930s. We had no spurs before June 2016 to now have 5 x Spurs in the Kununurra Museum collections, now, besides the two pairs mentioned, another machine-made brass, 'Mexican spur' circa 1910s to 1920s & oldest in the collection (may be USA machine made), with provenance to East Kimberley history. This odd spur had been found under or near the school-house in use at the Argyle Downs homestead school of the 1960s, by a teacher there at the time and kept by his wife. I know that KHS member Meg Gayoso had treasured this brass spur, in her life since that time and it must have been hard for her to part with it for KHS collections, so thanks to Meg, and hope you can be happy to hear that many visitors have already seen this on display and wondered at it's well machined structure, and to compare to the two larger pairs of Australian hand-made spurs. 75 Years of Ord Irrigation - History Forum - June 24-26 - A Great Success! Weekend of 24 to 26 June 2016 - A Great Success! On the weekend of June 24th to 26th 2016, we commemorated this history with various events that opened on the night of Friday June 24th with a KHS version of the 1946 Rosewood Station film with embedded history images and a documentary film, “On the Banks of the Ord” made by Kevin Richards. These were shown on the big screen at the Kununurra Picture Gardens. The following morning (Saturday June 25th) started at the original Carlton Reach – 'Ord River Experimental Farm' site @lias Lake Kununurra Golf Club, with an opening address by Matthew Durack (the son of Bill Durack, who had worked with his brother, Kim Durack at Carlton Reach 1942-1944). In June we commemorated thirty years since the inaugural meeting convened by Ursula Brimble and chaired by Dennis O'Brien, who (I learned only last week - AB 29 V 2016) that Dennis had told the convenor, Ursula Brimble, before the meeting that he would NOT be President however it transpired that he did indeed become the first KHS President at that meeting in 1986. Dennis was made an Hon. Life Member of the Society a few years ago for all he has done for and archival collections donated to the KHS archive. This first meeting resulted in the formation of the Kununurra Historical Society Inc. (KHS) (Us! ;^) on June 5th 1986. An Open Day & Evening at Kununurra Museum from 12 to 8pm - Sunday, June 5th 2016 - 30 Years! The night before this (Saturday June 4th) we enjoyed a KHS Members Dinner - Thank you to all those who sent acceptances or apologies. 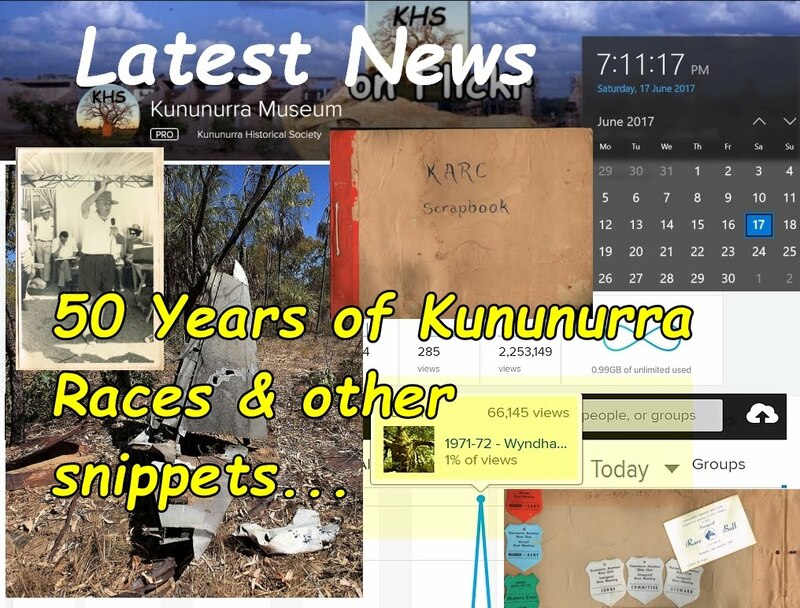 A new page has been created that outlines this history, illustrated with newspaper articles from 1986 and includes the full inaugural meeting minutes - See the History of the Kununurra Historical Society from the KHS Research Page. They were out over the Timor sea, in the Joseph Bonaparte Gulf, when their engine suddenly lost power and oil spread out over the windscreen, which Lew found was hot on his face, when he opened the canopy to clean the windscreen. Carmody was able to take control with the twinned rear training controls of the Wirraway, while Lew cleared the oil from his face, having already headed the aircraft to port, south, towards Australia! It was still around 20 km to land, but with their altitude, the stricken plane managed the distance to the coastline. They glided in over one of the widest stretches of saltmarsh, where it is about 40 km from sea to bush, with a dead flat saltmarsh between. Wirraway means Challenge - Read more and see listings of the eight Wirraway-Challenge digital videos. We have now had 1,992,492 (1.99 Million) Image Views (Dec. 7 2016). In December 2016 or January 2017 - Will you be our 2,000,000th Viewer? The KHS photographs on the Flickr site, have now had over 1,938,650 image views (August 20th 2016). In Feb 2016 it was 1,760,057, a good increase of 70,789 views in the two months before (Feb 2016). Views peaked on January 28th – 7,006 views on that day. In March 1941 Kimberley Michael Durack (KMD) published a thoroughly researched document, 'Developing the North - A Proposed Research Station for the Kimberleys,' and by the end of 1941 his proposal had become a reality. 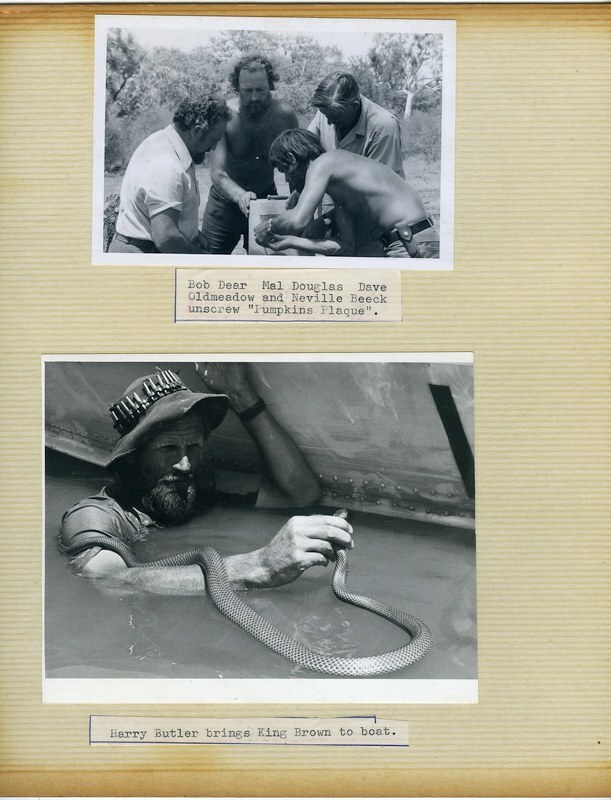 In 2014 it was realised that we did not have this document of great significance to Ord River Irrigation history, in the KHS archive, so in February 2015 the document was photographed at the Battye Library, then back in Kununurra each page was transcribed by KHS volunteers. Since then the transcriptions and 'Proposed Research Station' page images have been compiled into a new electronic document format, which we are placing online to make this accessible to all. 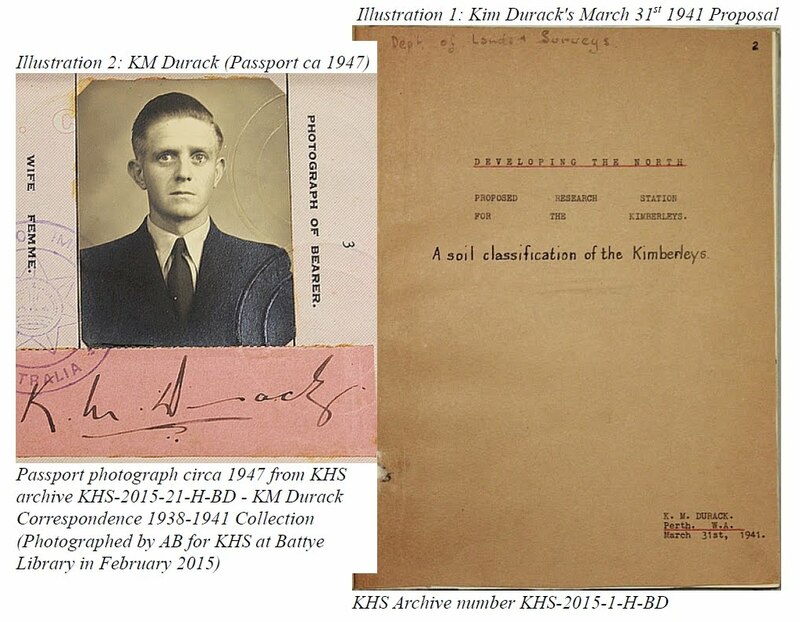 Download KHS archive number KHS-2015-1-H-BD - 'Developing the North - Proposed Research Station for the Kimberleys' (5.6 MB) written by KM Durack and published 75 years ago on March 31st 1941 (in 2016). KHS hopes you enjoy and we would appreciate any feedback you may have. In 1886 the town of Wyndham came into existence and the rush was setting in for 'Kimberley' (Halls Creek) goldfields, with ships arriving the tent city of Wyndham soon turned into a town. Visit Halls Creek and Wyndham in 2016 and make sure you go to the old Courthouse in the Port to the Wyndham Museum and experience the history there too mark 130 years. 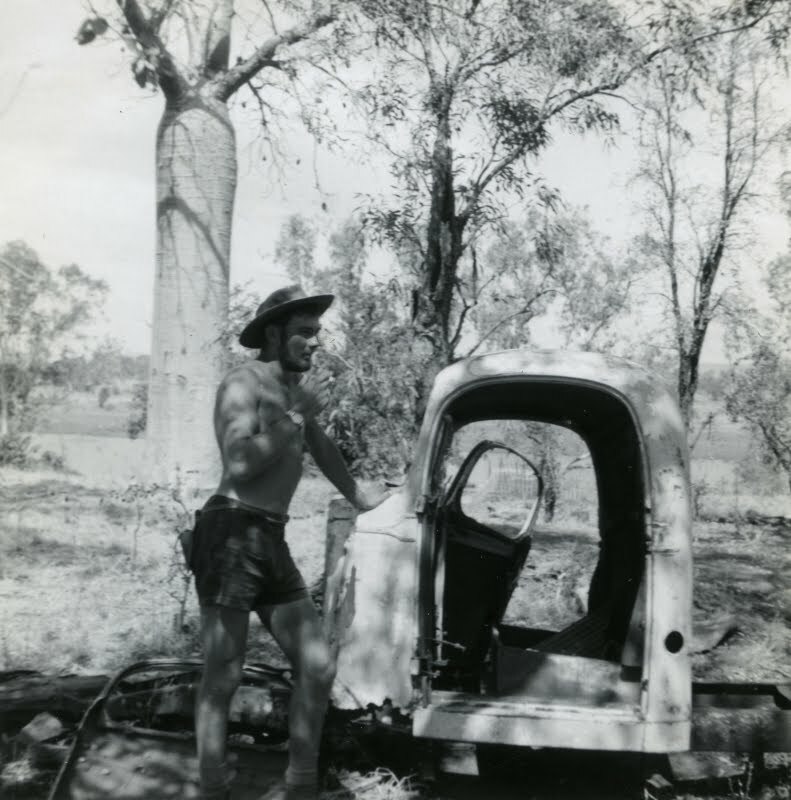 In November and December 1941 KM Durack's proposal was becoming a reality as land was cleared and the Petters 36HP engine was being installed, heralding the first experiments focusing on fodder crops to aid the pastoral industry that would continue and expand until 1945. The Carlton Reach Research station site was decommissioned and relocated to a new site on the east bank of the Ord down-river from Ivanhoe Crossing, where there were more representative soils, including blacksoil, and a good reach of water, on the site which Kim Durack had selected some years before, at Dillon's Bottle Tree. In May and June 1946 the first land was being prepared to start the Kimberley Research Station, as a Commonwealth (CSIR) and WA Department of Agriculture joint facility, marking the Commonwealth's first involvement that would lead to the national development of the Ord River Project. 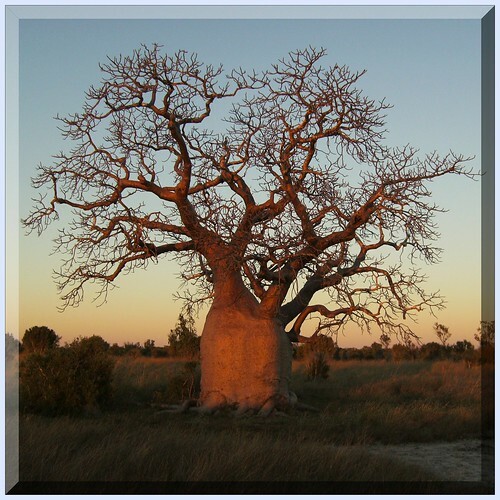 "Dillon's Bottle tree" is a named Boab tree (Adansonia gregorii), most likely named after (for/by?) James Dillon, one time manager of Ivanhoe station (1899). See the KHS Dillon's Bottle Tree Set on Flickr from the embedded slideshow here (Once playing, click on the four cornered gadget in the lower right hand side to go full screen and for further information on each image). Amazingly in 2016 our 'new' purpose-built archive and museum facility, today known as the Kununurra Museum, will have been in operation for fifteen years. This amounts to half of the existence of the Kununurra Historical Society, having been inaugurated on June 5th 1986, we will be commemorating 30 years as a society. Since locating and researching the provenance of the 36HP "Petters Atomic Diesel Engine," KHS member volunteers have worked at trying to make the engine more accessible (to all! :-), for display at the Kununurra Museum, to help show the local, State and National significance of tropical agriculture on the Ord and in the Kimberley Region. The engine first used for irrigation from the Ord River in 1941 is now in the Kununurra Museum grounds. The Petters 36 HP - Carlton Reach Pump Engine in place at the Kununurra Museum on October 24th 2013 KHS Archive Number - KHS-2013-124-P-BD - Note that the original river loam is still embedded in the fly-wheel and outer belt pulley wheel, left there when the engine was removed from the Ord River east bank at KRS, by Murray Shiner and one of his excavators, some years ago. A request was made when moving the engine this year, to leave this in place and amazingly this soil has remained in place throughout the various movements to get to the museum grounds. Read more on the KHS News Page. Hope you enjoy the slideshow - Use the four-cornered gadget to lower right of screen (below) to see Full Screen - Use 'Show Info' for detailed image information. You can now see the current KHS Constitution here on the website or as downloadable PDFs from there. The Official Opening of Ord Stage I and the Ord River Diversion Dam took place at a Ceremony on July 20th 1963 - On that date in 2013 (this week), Engineering Heritage WA along with support from the Water Corporation of Western Australia, will unveil a new interpretive panel at the Kununurra Swim Beach, about the Ord River Diversion Dam, with some images and the history supplied by KHS. This will incorporate a lunch for invited guests and a tour of inspection over the Ord River Diversion Dam, which is normally closed to pedestrians. Later in the day from 2pm the Kununurra Museum will be open for the visiting pioneer engineers, VIPs and guests. Do you know who officially opened Ord Stage I and the Ord River Diversion Dam? 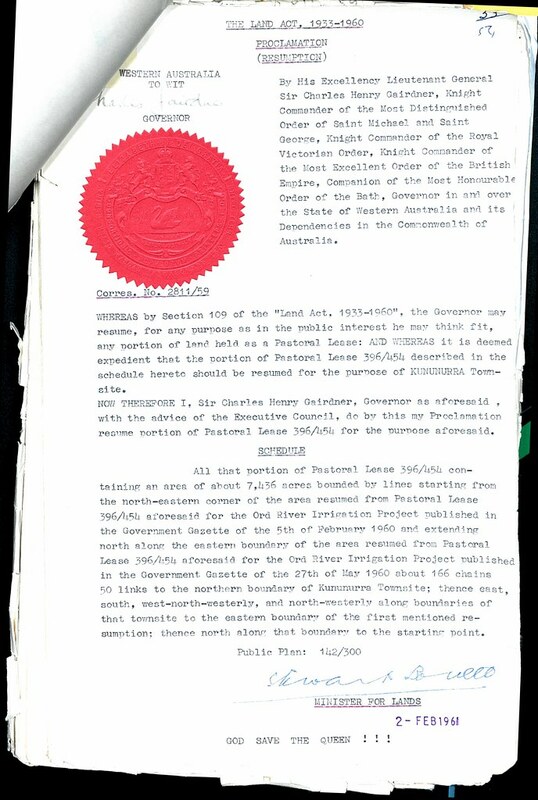 In 2013 it was 50 years since July 20th 1963, when the official opening of Stage I of the Ord River Irrigation Project, by then Prime Minister, Sir Robert Menzies. On that day, Menzies described Kununurra and the Ord as "the most exciting place in Australia". Photographs of the opening ceremony event and tours Menzies made of the Pilot Farm and a cotton harvesting demonstration can be seen in the slideshow. View an embedded SlideShow of photographs of the July 20th 1963 Diversion Dam opening, from various KHS archive collections, here while on this page. NT Chief Minister's NT Book Award to Darrell Lewis for "A Wild History"
Congratulations go out to Darrell Lewis, who has been visiting Kununurra this past week, attending several Kununurra Museum functions, a few days after he had been present in Darwin to receive the NT Chief Minister's - History Book Award, as equal winner, for his book, "A Wild History - Life and Death on the Victoria River Frontier." This is a fascinating, well written and referenced, easy read for the general public, being an early history (to circa 1910) of the entire Victoria River district, from Katherine to the East Kimberley WA/NT border regions. Down the Duncan Road and out to the southern side of the Buchanan Highway to beyond Birrindudu. There on the edge of desert country, on the northern slopes of the Browns Range, lies a belt of about 280 "big, old" boab trees, cut off by great distance from the nearest of all other Kimberley boab trees, and close to where the Leichhardt name-plate is said to have been found over a century ago. A new book by Darrell Lewis. Could the famous lost explorer have made it past the Kimberley? Read more about a new book launch on Thursday May 16th at the National Museum of Australia from the KHS News page. Thanks to Museums Australia (the peak body for Museums in Australia), the KHS President was successful in applying for a bursary, to help cover costs associated with travel between May 15th and 23rd, to attend the Museums Australia Conference in Canberra, which has a great range of topics relevant to a regional museum (See full conference program from KHS News). The Department of Agriculture and Food WA - Frank Wise Institute (of Tropical Agriculture - formerly Kimberley Research Station - KRS), have donated the original Carlton Reach Pump Engine, a 36HP "Petters Atomic Diesel Engine," to the Kununurra Historical Society. KHS member volunteers hope to install the engine by the Kununurra Museum entrance gate. Read more in KHS News - Carlton Reach Petters Engine Donated to Kununurra Museum and on the Carlton Reach Pump Engine page. You can also see some research on the RAAF Convair aircraft A96-353, that carried the Royal Tour party to Kununurra, from the KHS Research page. Hoping you enjoy this visit to the gateway for the Kununurra Museum's online presence. If you are in the East Kimberley visit the KHS Archive, Gallery, Library, Museum & Research facilities in Coolibah Drive - Contact KHS or Join KHS Now!. Please remember we are a completely volunteer run community museum and at times may not be open for advertised hours, however we are flexible in that we can be contacted to open outside advertised hours. It is easy to navigate the site using the Short Contents (Links on this Page :), and the Heading links to get there fast! eg. click the "Did You Know..." title link below. Did you know that Kununurra was a stop on the Royal Tour of 1963? In 2013 it will be 50 years since March 17th 1963, the day the Royal Tour landed, reputedly, the first (and only?) time, that the Queen has landed on an unsealed,(gravel - "dirt strip") runway. Do any royal watchers know if this is true? If so please contact us. Some new images of a control tower, which was erected for the 1963 Royal Tour, then dismantled. It was made of scaffolding, but no doubt equipped with the latest technology available in 1963. These photographs and others in the collections also show two RAAF fire tenders, which were reputed to have been flown to Kununurra on RAAF transport aircraft, then flown away. The newly made accessible images of the control tower were from a 2007 accession to the archive, being part of a collection sent by the Civil Aviation Historical Society (WA). Other images from this collection are now being placed online. It would be great to see if there are any photographs of the Royal Yacht, Brittania, alongside the Broome jetty, or any others you may have of the Royal Tour to the Kimberley in 1963. Please contact us if you do and tell us your story on this or any other Kimberley history. 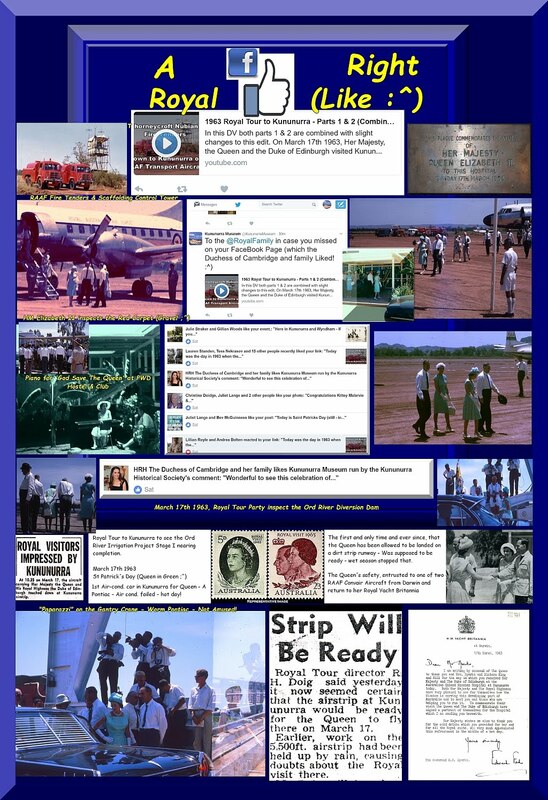 View an embedded SlideShow of still images from the KHS Flickr site of the Royal Tour in Kununurra, from various KHS archive collections, here while on this page, use the right hand cornered gadget to go full screen. It is easy to navigate the site using the Short Contents (Links on this Page :), and the Heading links to get there fast! eg. click the "Welcome..." title link above. [The full version of the cropped photograph above is available from 1962-08-ca - Ord River Diversion Dam crossing the river - KHS-2011-31-379-3.17-P2-D (Link goes to that image on Flickr in a new Tab) - You can most likely only see the first ten, gateways of the Ord River Diversion Dam gateways above, but if you scroll across to the right you can see all 20 of the gateways, under construction during 1962 (50 years ago in 2012). The image comes from the KHS - Kevin Richards Collection. Kevin was an entomologist for the WA Department of Agriculture, based at the Kimberley Research Station in the Ord River Irrigation Area. The Kununurra Historical Society was inaugurated on June 5th 1986, as an archive for regional history, which, with your volunteered help and your histories, can continue to be an archive and museum, for interpreting the Ord's development though this history, which is of Regional, State and National "Significance," for present and future visitors and communities in Kununurra. 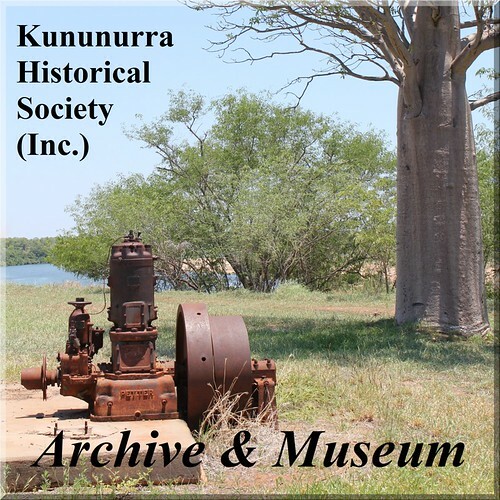 If you are in Kununurra - Visit the KHS Archive, Library, Museum & Research Facility on Coolibah Drive - Come in for a visual feast of some of the town's short, but incredibly interesting, history, which KHS has been collecting and documenting during the past 27 years, to preserve for our community and for future generations. In the mean time ENJOY! our history site. - Sharing Your Histories! To search the entire site, use the search box at the top of the page, which by default will search the site. KHS is seeking past and present Kununurra residents to participate in a project to celebrate the 50th anniversary year of the town by calling on all businesses, Government Departments, Organisations, Clubs, Associations, and especially people to supply and share a history of their Kununurra involvements. - See Your Kununurra History. See over 2500 photographs that have been digitised and documented by dedicated KHS volunteers. Read more about KHS on Flickr (here on this site : ) for an overview of the best ways to view the archive images on the Flickr site. For an overview of how best to view collections visit KHS on Flickr (on this website), before viewing these links on Flickr. KHS would like to share some of the great new images that people have been sharing with KHS to make this ACCESSIBLE to You! You too can share your images in two of the new Public Group Photo Pools that KHS has started on Flickr. "Have You Lived in Kununurra?" People have already submitted some great images to both of these Group Photographic Pools - Click the link (below) or the Boab to get there! KHS Google Profile has links to other profiles - eg Facebook, Flickr, Web, Pages and Sites we have contributed to, etc. View the "KHS Flickr Profile for more detail on our digitisation program and the KHS Flickr site in general. OR for some tips about now best to view in the many and varied ways available, see KHS on Flickr (here on this site). Hope you enjoy these KHS experiments in "Accessibility" to KHS archival material. Don't forget to ADD the KHS Website http://www.kununurra.org.au/ to your "Favourites" (Right Click - "Bookmark") and keep coming back as new images are uploaded over coming months. The "CountDowns" that are in the side bar are all related to either current events for KHS or any Historic Events, to keep the Kimberley History Community informed of approaching anniversaries. If you know of a date for ANY Kimberley history event you can submit that for inclusion. - Contact KHS. - "Significance refers to the value and meanings that items and collections have for people and communities. Significance helps unlock the potential of collections, creating opportunities for communities to access and enjoy collections, and to understand the history, cultures and environments of Australia". From Significance 2.0 a guide to assessing the significance of collections, by Roslyn Russell and Kylie Winkworth for the Collections Council of Australia Ltd. (Now axed - This may still be available online as a PDF - Search title). 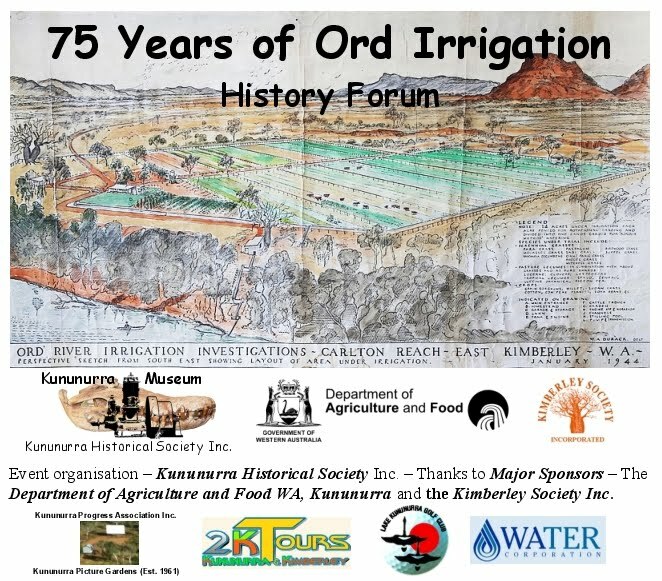 5 75 Years of Ord Irrigation - History Forum - June 24-26 - A Great Success! 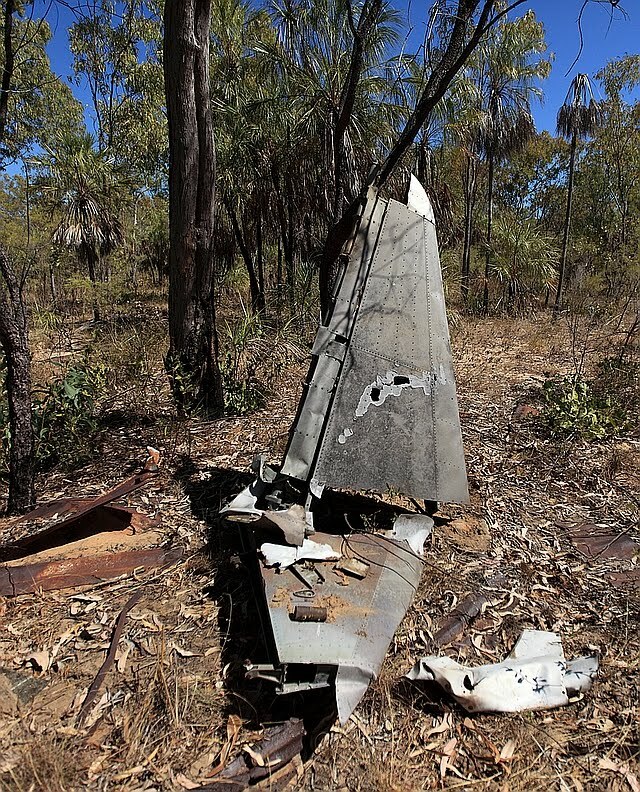 1.1 Part 5 of 8 - Wirraway A20-62 Forced-Landing (The Main Story) - 29 min. 4.1 1963 Royal Tour - Royal LIKE! 4.6 Museums are ******* Awesome! 4.7.1 On Tuesday, June 14th 2016 at 7pm at the Museum - A Great Talk! 5.1 Weekend of 24 to 26 June 2016 - A Great Success! 6.1.1 We have now had 1,992,492 (1.99 Million) Image Views (Dec. 7 2016). 6.1.2 In December 2016 or January 2017 - Will you be our 2,000,000th Viewer? 6.7 NT Chief Minister's NT Book Award to Darrell Lewis for "A Wild History"
12.1 Have You Lived in Kununurra? 12.2 Have You Lived in the Kimberley? Kimberley History Site. Please come back again!